(CNN) -- Former President George W. Bush is writing a book focusing on defining decisions he's made in his personal and political life, a publishing house announced Thursday. Former President George W. Bush will discuss some of the defining decisions of his presidency in a new book. The book, tentatively titled "Decision Points," is to be published in fall 2010, according to the Crown Publishing Group. Financial terms weren't disclosed. The book will focus on about 12 important decisions made by the former president. Topics will include his decision to run for president, his choice of his closest advisers, the September 11 terrorist attacks, the wars in Afghanistan and Iraq, his response to Hurricane Katrina, the forming of his stem cell research policy, his decision to quit drinking, how he found faith and his relationships with his father, mother, siblings and wife. 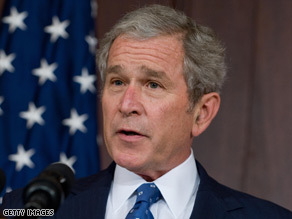 "I am spending time on the book every day," Bush was quoted saying in a news release. "My goal is to bring the reader inside the Oval Office for the most consequential moments of my personal and political life. "I look forward to painting a vivid picture of the information I had, the principles I followed, and the decisions I made," Bush said.